Each drive is built around a heavy duty extrusion that runs the full length of each drive. Support legs are connected directly to this extrusion to bear all weight. A 1/8” thick steel enclosure is added for additional strength. Studies show that the majority of shearing time is consumed in set-up…not shearing. SQUAGEGAGE reduces that set-up time and increases shear productivity, especially when accurate square blanks are required. Several cuts can be made on the same blank without putting the piece down. SQUAREGAGE rapidly repositions after each shear cycle with the operator holding the part against the front stops and/or squaring the arm. Oftentimes, the finished blank remains in hand to reduce retrieval time and eliminate material scratching. Some customers simply use SQUAREGAGE as a go-to gauge for single position cuts. The typical Squaregage user can usually be identified by large piles of material in front of the shear, and oftentimes two operators. Work pieces are often larger in size so backgauging introduces too much sheet sag. Also, if the dimensions and squareness of the blank are critical, it must be gauged from the front with scrap falling off the back. Operators often use the Squaregage front gauge system as a quick go-to gauge although sequential positioning is possible. Angle cutting is also possible. Learn More about the Squaregauge Front Gauge System by clicking on the tabs above. 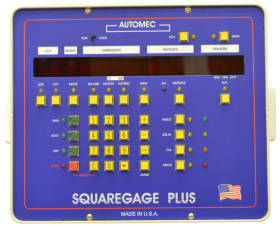 Read our CNC Squaregage Transcript. CNC Squaregage is a precision front gauging system for power shears consisting of a digital display, a computer unit, and one two or three mechanical drive units, depending on the application. The drives are spaced so that the operator can stand between the and manually reposition the workpiece. A movable squaring arm is located on top of one of the drives. Because of the efficiency of this system, several cuts can be made on the same blank without putting the piece down. Square gage rapidly repositions after each shear cycle with the operator indexing the part against the front stop and the squaring arm. The finished flank remains in hand to reduce retrieval time and eliminate material scratching. This video will address some of the common application issues associated with mounting the square gage to the shear. The optional air finger showing here retract and are out of the way when the fingers travel from one point to another. This allows the user to spin the workpiece and minimizes scratching. Notice that the fingers pull back three-eighths of an inch to clear the finger from the material before retracting and moving to the next gauge. Our most popular system is set up as a triple drive with a ten foot or 12-foot squaring arm and two auxiliary six foot arms. Ball transfers are shown here, which help with material handling. The squaring arm finger is ideally located two and five sixteenth of an inch from the square edge, which mounts on top of the square gauge arm. This means a slot must be machined by Automec or a shear manufacturer for the customer. The shear table must be at least three inches thick because the slots are machined one and one-eighth inch wide by one and one-eighth inch deep. The front finger can protrude from the edge of the shear table up to 18 inches towards the knife. Narrow pieces can be gauged by holding them against the squaring arm and one finger. Ideally, the second drive should be placed approximately 30 inches from the square edge so that pieces from 30 inches to 50 inches can be gauged while allowing the operator to stand between the drives. The third drive should be installed approximately six to eight feet away from the second drive so that wide pieces can be gauged accurately from left to right. Programming the square gauge is simple. The operator simply keys in the desired front gauge dimensions and then presses the advance key to move the gauge to position. Each time the shear cycles, the front gauge advances to the next position. Square gauge can be programmed to move automatically after each year cycle, or can remain at one position until the operator advances to the next step manually. There are many possibilities and variations of the square gauge depending on your application. We’re sure you’ll find the square gauge to be one of the most valuable assets to your shearing operation.